I like to use superlatives a lot. Does that hurt my credibility? Probably. (Or perhaps I should say, MOST DEFINITELY.) For example, how do I really know that this recipe for popcorn is the best? 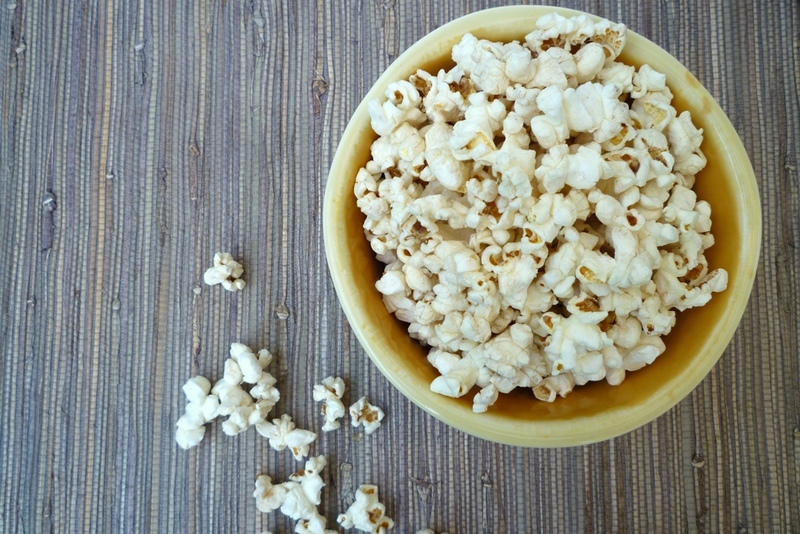 I’ve tried many variations of homemade popcorn. But I couldn’t possibly have tried them all. So how do I know this one’s the best? I don’t really have a good defense. This popcorn is just so good, it feels like it deserves the title of “The Best” even if I don’t really have the right to say it. Would you trust me more if I told you that my grandfather was in the popcorn business? My grandpa (the Polish one, how I got my name) was a postman. But every summer he used his vacation days to make some extra money for his family of four children by selling popcorn at the Minnesota State Fair. He made his popcorn in big machines, but the ingredients were the same I use here: popcorn, coconut oil for popping, butter and salt for deliciousness. Some years ago I realized none of the popcorn I was eating was all that spectacular (air popped). Some of it was even kind of gross (movie theater, microwave). Where was the good popcorn? Where had my love of it come from? Sadly, it did not come from my grandfather. He died when I was four, and I don’t remember eating any of his popcorn. I searched my memory for the best popcorn I have ever had, and here is what bubbled up: When I was in college I studied abroad in Sevilla, Spain, for a semester. The kids there stayed out LATE, as in 4:00 or 5:00 in the morning. I was unfortunately too shy to really embrace this new and foreign culture in only a few months, so most of my nights were relatively quite tame. One night, however, I found myself in the middle of where everyone else was, dance/hopping in some club with a bunch of people wearing strange hats. (I never figured out what that was about.) Anyway, it was a breathless, let-loose, night to remember, and I bet you can guess what it all culminated in: popcorn. A street vendor was selling small, skinny, vertical bags of popcorn. The smell was enticing, the taste was perfect. The popcorn was salty, but not too salty. It had the good flavor that only comes from enough fat being involved, but it wasn’t greasy. The perfect popcorn! So now, as a result of my efforts to recreate that yummy popcorn gobbled on a dirty Spanish curb, I am able to present to you my version of the best homemade popcorn, a modified version of the popcorn my grandpa made so many years ago. It’s popped on your stove with coconut oil (the organic kind, it’s supposedly good for you), the butter is melted in while the corn is popping (because it’s easier and doesn’t leave the popcorn greasy), and the whole thing is seasoned with just the right amount of salt at the end. I’d say it’s time to plan a movie night! Put the 3 tablespoons of coconut oil into a large pan with a lid. (I use my pasta pot. A clear lid is particularly helpful.) Turn the heat to medium (if you have a weak stove, use medium-high). Add three kernels of corn to the pan and cover. When two of the three kernels have popped, add the rest of the popcorn and the butter, and close the lid. Making sure to protect your hands using hot pads (oven mitts would be excellent if you have them), tilt the pan back and forth or gently shake to move the corn around on the bottom of the pan and swirl the melting butter. Every one or two seconds, crack the lid to vent the steam from the pan. Continue to rock or shake the pan while venting until the popcorn is fully popped. This can seem tricky at first, but you will develop your own technique over time. I look a bit like a new mom rocking her (hot and occasionally painful) baby. 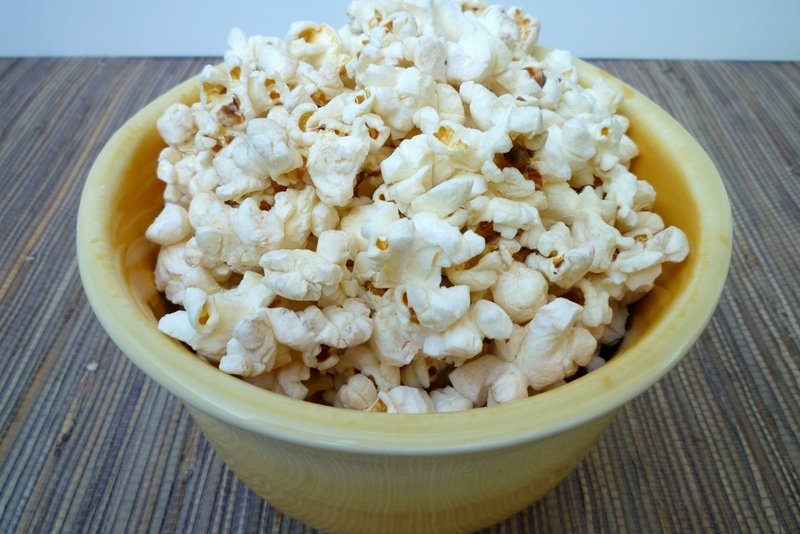 Just as you do when making microwave popcorn, listen for the sound of the kernels popping. When the popping slows to more than a second or two between pops, you know you’re done. (Err on the side of not-burning to avoid becoming extra sad.) Remove the pan from the heat and uncover. Measure half of a teaspoon of salt into your hand. Using your other hand, sprinkle the salt a little at a time onto the popcorn, stirring as you go.